Lovely modern apartment, very close to beaches, shops, bars and restaurants. With the beautiful sandy beaches of Bournemouth 5 minutes walk away, this apartment is the perfect location for your family get-away! This is a modern, light and very spacious ground floor apartment just a 5 minutes from the award winning, blue flag beaches of Southbourne, Boscombe and Bournemouth. The clifftop and pathway down to the beach are just at the end of the road. The property is situated on a very quiet, tree lined street yet the beach, restaurants, and other facilities such as shops, cafes and bars are just moments away. The apartment comprises of a large, sunny and airy open plan living room leading into the kitchen diner. The lounge has double aspect windows and there are 2 brand new leather sofas (one with small pull out bed) and a leather armchair with foot rest. There is a large LED TV with Freeview HD and a DVD player, a Wii console with controllers and games (including Mario Cart), a PS2 with controllers and games, plus plenty of board games, DVD’s, puzzles and books to keep guests occupied. There is free WiFi broadband, along with a selection of books, DVD’s and board games for you to use during your stay. The spacious kitchen/diner features a washing machine, dishwasher, large fridge and freezer, microwave, gas stove with separate oven and grill and coffee machine. There is a dining table with seating for 6 with 2 extra chairs and a high chair. There is plenty of cupboard space for shopping and groceries. There is a 'combi' boiler meaning all hot water is instant. Utilities, gas, water and electric are included in your rental. There is a large selection of crockery, cutlery, pots, pans, kitchen utensils and other kitchen accessories for your use. There is a good sized fully tiled family bathroom with bath/shower, toilet, basin and heated towel rail. There are three bedrooms. The largest, the main master bedroom is very light and bright having four windows. There is a double bed, wardrobe, and chest of drawers with plenty of storage. There is also a wall mounted flat screen TV with integral DVD player. The master also has an en-suite with a walk in shower, toilet, basin and chrome heated towel rail. The second bedroom has a double bed, 2 bedside tables and wardrobe with drawers. The third bedroom has bunk beds which are ideal for children, and a chest of drawers. There is also a large travel cot with mattress. In the living room the double sofa pulls out to provide a small double bed, ideal for 2 children. In total the apartment can sleep 8 with an additional travel cot for a small infant. We do NOT provide bedding or towels so please bring your own with you, duvets and pillows are however provided. All windows have blinds and are double glazed for heat and noise insulation. The accommodation has central heating controlled by a thermostat in the hall. We have an entry-phone system fitted for your added convenience. The apartment is neutrally decorated with a nautical, seaside theme. We have private off street parking, directly to the front of the apartment for 2 cars. However should you need additional parking, the road is extremely quiet and safe to park other vehicles, and there are currently no parking restrictions. The building is enveloped by a small, pretty communal garden which is regularly maintained. Just around the corner from the property are private tennis courts which you can access with a fob key provided. Please remember to bring your own bats and balls. There is a children's playground next to the tennis courts. Boscombe town centre, our closest town, is just 5 minutes walk from the apartment, and has many shops, delis, cafes and restaurants. There is a large Sainsbury's, Lidl's and an Aldi. We have some wonderful independent restaurants close by including, Thai, Italian, and Indian. These are all within a 5 minute walk away. We are happy to give our recommendations! Ten minutes walk away you will find Southbourne town centre, an up-and-coming town, with a high street filled with nice independent shops, Sainsbury's Local, Tesco Metro, cafes and quirky bars and restaurants. Parking is free and very easy to find here. Our apartment is ideally situated so that you can easily explore Bournemouth and much further into Dorset. Boscombe is serviced by a very efficient bus service, if you prefer to leave the car at the apartment. Buses stop at the end of the road, and from here you can visit Swanage, a traditional pretty seaside town, Studland, for beautiful beaches and stunning walks, Sandbanks, for its blue flag beach and trendy bars, and Poole, for its shops and quaint Quay. In the opposite direction, Mudeford Quay and Christchurch are well worth a visit, and Hengistbury Head for its stunning seaside walks. Pokesdown, our closest train station offers easy access also to these places and trains run direct into London Waterloo. For a bigger shopping experience, Castlepoint is a 10 minute drive away, and here you will find M&S, River Island, Asda, B&Q and many other big stores as well as plenty of restaurants. Bournemouth now boasts the brand new BH1 Odeon complex with multi screens and many restaurants and cafes. Conditions of booking: We DO NOT accept Hen or Stag parties, and the lead person booking, must be over 25. Check in is from 2pm and check out is at 10am. A £250 refundable damage deposit payment is required which is held by Owners Direct and refunded within 10 days of your stay ending. A Booking Contract must be completed prior to your stay. We prefer to rent weekly during busy times, but can be flexible where possible. A late check out can be arranged where possible and is £50 up to 4pm. I currently live in Kent, but spent many a happy childhood holidaying in Dorset, I also try to get away to Dorset whenever I can with my family. When I found this apartment I knew it was perfect for our needs. Very close to the beautiful beaches, yet convenient for shops, trendy bars and restaurants. For its ideal location. The stunning beaches of Bournemouth are just 5 minutes walk at end of the road, so if you are looking for a perfect base to holiday this apartment provides it. As well as its stunning sandy beaches, walking and cycling is a wonderful way to explore the Dorset countryside and coast from the apartment. There is a fantastic bus service at the end of the road, so leave the car, and venture to Bournemouth, Christchurch, Swanage, Corfe and beyond! Shops and restaurants are close at hand, and the apartment has everything you need to enjoy a meal indoors, if you'd prefer, but why not have a coffee or drink at one of the lovely bars that feature along the clifftop or promenade first. Spacious, modern and clean with newly fitted carpets. Quiet location, yet close to everything. Free off street parking. Combi boiler for instant hot water. Two sofas (one sofa bed) seating 6-7 plus additional chair. The dining table comfortably seats 6, with extra chairs to seat 8. 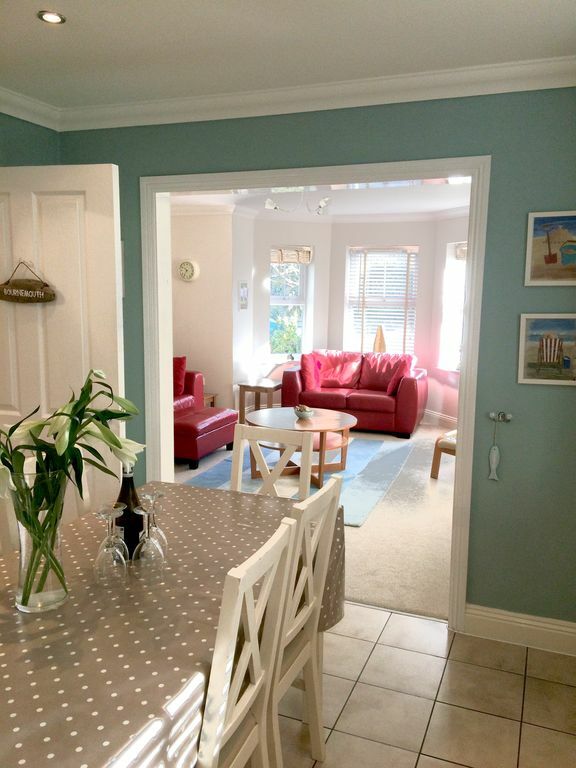 This apartment is the perfect home-from-home, and provides everything you need to enable you and your family to have the perfect holiday by the seaside. the apartment is modern, clean and has the facilities as described. it was a surprise to have to bring our own linen and towels, but we have not used this type of accommodation before, and that is perhaps more our lack of understanding. the apartment is 15 min walk to the beach itself (5 to the front and 10 mins to get down the various paths and slopes). there is parking at the front (for free) so you could be there in 10 mins if you drove.. We would definitely stay again. Fantastic accommodation and perfectly situated for our needs. The property was in excellent condition.very clean and well maintained. Close to beach, local amenities and lovely Christchurch. The apartment was ideal for our group of seven. We would definitely book it again if we come down south for our next reunion. Clean, bright and large flat. Perfectly located. Would most definitely stay again. Such ease with booking and picking up keys. Great holiday flat. Well situated. All accurate information as described. Would definitely recommend. If you are after clear air, sweeping cliff walks, breathtaking views and snug little towns brimming with restaurants and shops to explore, Dorset is for you! Dorset is as multi-layered as the famous fossil flecked cliffs along its Jurassic Coast - a stunning stretch of 200 million-year-old shoreline that has been designated a Natural World Heritage Site by UNESCO due to its outstanding geological make-up.The charming countryside Dorset has to offer has been designated as an Area of Outstanding Natural Beauty and its easy to see why - take some time to discover this beautiful county at your own pace.There is more to Dorset than just fabulous scenery and magnificent coast - the history of this county is rich and vivid. How many areas do you know that can boast a huge naked chalk giant, England's first Natural World Heritage Site and the largest hill fort in Europe?!! All over Dorset, you'll uncover charming market towns and tiny villages tucked into tranquil rural locaio. Each town has its own individuality, character and history to relate. It is no wonder that the area has captivated film and TV makers from all over the world. Productions of all kinds have been filmed on location here, with Dorsets unspoilt countryside, dramatic coastline and spectacular historic houses and gardens being used as a backdrop to the action. Southbourne high street is only a 15 minute stroll away with its charming shops, bars and cafes including the very popular Ludo Lounge, Deli Rocks and the Larder House. Cafe Riva and the Commodore pub sit on the clifftop with beautiful views over the clifftops and beaches.In the opposite direction is Boscombe high street with a large Sainsburys, post office, coffee shops, street market on Thursday and Saturdays. There are plenty of bars, restaurants and takeaways to choose. Situated at the end of our road is the excellent Little Pickle Deli Cafe where you can buy local food and drinks. Bournemouth town centre is approximately a 40 minute stroll along the beach, or 10 minutes by bus or car. Here you will find cinemas, bars, nightclubs, restaurants, theatres, the BIC (international concert venue), a large selection of shops with both high street chains and designer. From the town centre, you can walk through the gardens to the pier, perhaps stopping on the way to play crazy golf or fly high in the Hot Air Balloon to get an amazing view of the area. Just around the corner from the property is Shelley Manor where there is a medical practice and pharmacy. There is also an attached theatre with local productions. Shelley Manor has a large park behind it which leads onto the clifftop and beaches. There are private tennis courts which you can access via the fob key provided. There is also a childrens playground in the park with swings and climbing frames. Other nearby facilities:Just a 10 minute walk away is Kings Park which is home to Bournemouth football club. There is also a skate and BMX park, crown green bowling square plus a large Athletics stadium. Just past Kings park is Queens park which has a golf club open to the public. The Littledown Leisure centre is a 10 minute drive away, and has swimming pools and waterslides, outdoor and indoor football courts and gyms. Next to the centre is a park with a small lake, paddling pool and the 'Altitude' High Rope Adventure Park. Across from the centre is a large 24 hour Tesco superstore. Behind Tesco is Christchurch Golf centre and driving ranges which are open to the public. A further 5 minutes drive from Tesco is Castlepoint shopping centre with many large high street retailers including M&S, Next, Asda, Sainsburys, Sports Direct, Currys, Topshop, Gap, Game, River Island, cafes and restaurants such as Nandos and Franky & Bennys. To access nearest beach, simply turn right out of the property and walk 200m to the end of the road and you will be on the clifftop. (If you look to the East / left, you should be able to see the Isle of Wight). Turn right and walk 100m to the Manor zig-zag which takes you down to the beach. At the bottom there is a small shop open in the summer months selling hot food, ice creams and drinks. There are also public toilets.If you turn right at the beach and promenade, you will see Boscombe pier. There is the excellent Urban Reef restaurant and bar and a Harvester pub. There is Sorted Surf shop where you can hire surfboards, wetsuits, paddle boards and kayaks. Lessons are available throughout the year. If you walk past Boscombe pier, you will see Bournemouth pier in the distance. It is approximately a 30 minute walk away or alternatively you can hire a bicycle from the surf school which is situated just up the hill from the pier. There is a wonderful bus network which services local areas, and further afield, pretty Christchurch, Wareham, Corfe and Swanage.